ENGINEERING. PRACTICE. POLICY. 37 February/March 2018 unmanned systems inside this' or 'If I just added this capability,' just bring it back and see if we can't iterate it and rapidly prototype it here." There are different types of maker spaces said Julia Spicer, executive director for the Mid-Atlantic Venture Association, but the tools and innovative energy found in some of these build-it/test-it/change-it organizations can help developers iron out a lot of kinks. When "you can bring together a place where (there's) technology, ingenuity and creativity to build—and to prototype—it advances, if you will, some of the opportunities for entre- preneurial kinds of endeavors." 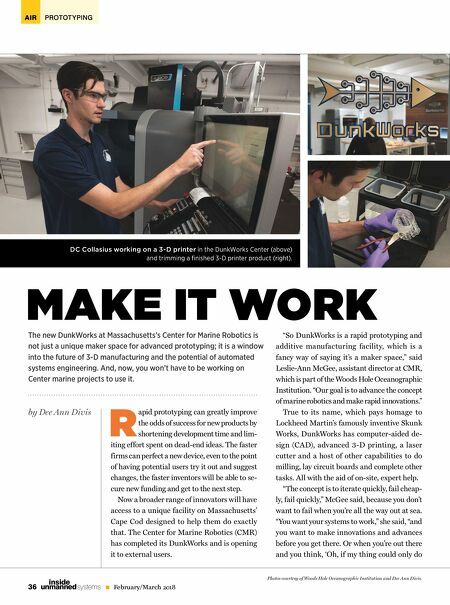 High-End Tools DunkWorks has a number of options for high-end additive manufacturing. During the July grand opening, staff member DC Collasius was printing pitch packs for a glid- er, an unmanned underwater vehicle. "So it's the battery pack for the inside of the glider, which actually moves back and forth to con- trol the pitch of the glider. So it's printing two of them right now," Collasius said. The printer in question can build a piece as big as 16 inches x 16 inches x 18 inches high. If something larger is needed the parts can be printed with serrated edges so they can be joined securely with adhesive. The plastic used is Acrylonitrile Styrene Acrylate, or ASA, a tough material resistant to ultraviolet radiation. "It won't degrade in the sun," Collasius said, "so it can sit out in the weather on the ocean and it won't wear down or anything like that (or) get weaker." Collasius is the DunkWork's "guru," McGee said. "We have folks come in and they might know the problem that they need to solve, or the advancement that they want to make, but they don't necessarily know how to do it," McGee said, so DC is here to help coach them through it. James Bellingham, CMR's director, has plans to take the DunkWorks' capabilities to a new level. "There are certain metal printing capabili- ties we would dearly, dearly love to have," he said, "which currently now are very expensive and actually have a sort of hazardous overtone to them." The issue is the powdered metal used for printing in some systems. Should it accidently become airborne, it might become explosive. There are new metal printing capabilities com- ing along, Bellingham said, that are less risky to use and offer much lower costs. He also plans to keep upgrading the plastic printers so they have cutting edge capabilities and he has his eye on adding "pick and place" systems—that is robotic assembly. "So you can imagine again, if you're build- ing up a system, it's not going to be all plastic," he said. "It's going to have electronic boards and it's going to have, maybe, some metal pieces. So is that going to be a human assembly process or is that going to be done robotically?" 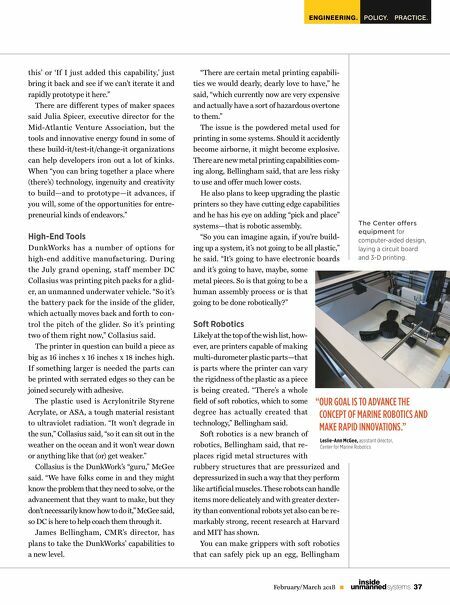 Soft Robotics Likely at the top of the wish list, how- ever, are printers capable of making multi-durometer plastic parts—that is parts where the printer can vary the rigidness of the plastic as a piece is being created. "There's a whole field of soft robotics, which to some degree has actually created that technology," Bellingham said. Soft robotics is a new branch of robotics, Bellingham said, that re- places rigid metal structures with rubbery structures that are pressurized and depressurized in such a way that they perform like artificial muscles. These robots can handle items more delicately and with greater dexter- ity than conventional robots yet also can be re- markably strong, recent research at Harvard and MIT has shown. You can make grippers with soft robotics that can safely pick up an egg, Bellingham " OUR GOAL IS TO ADVANCE THE CONCEPT OF MARINE ROBOTICS AND MAKE RAPID INNOVATIONS." Leslie-Ann McGee, assistant director, Center for Marine Robotics The Center offers equipment for computer-aided design, laying a circuit board and 3-D printing.